Ham and cheese sandwiches are great, for so many reasons. They’re family friendly, quick and easy to make, handy to eat on the run, perfect for picnics… the list goes on and on. But as good as it is, you can make it so much more. Here are five variations on the classic ham and cheese sandwich. On a baguette, bien sÃ»r! The French have two ways of eating a ham and cheese sandwich on a baguette. The first is very simple: with butter spread on the baguette, then ham sliced thinly and folded over shavings of good emmenthal cheese (what we would call Swiss cheese). Or, they fancy it up a bit with salade et tomates, ham, cheese and mayonaise. Another great way to make a sandwich is with Swedish flat-bread, the soft variety. 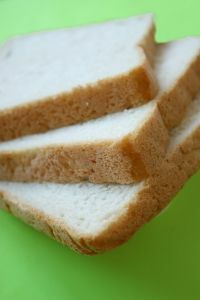 Use three slices of bread, cut into half circles, to make a double decker sandwich. I like tomatoes, lettuce, mayonaise and sliced hard-boiled eggs with the ham and cheese. To snaz it up even more, use sprigs of fresh dill. If you don’t have any fresh, mix a little bit of dill, crushed cumin and fennel seed into the mayonaise about an hour before spreading onto the sandwich. This is the French version of our grilled cheese, and it is yummy! Sometimes I think my father comes to France just to be able to order these. Butter one side of each slice of bread. Mix the grated cheese with just enough cream to help it stick together, not too much or it will be runny. On the buttered side of bread put the two slices of ham, folded; add some of the grated cheese mixture. Place the other slice of bread on top, buttered side down and top with more of the cheese mixture. Bake until the cheese melts, about 8-10 minutes. If you want to make a Croque Madame, then fry the eggs until the white is set, but not the yolk; place the fried egg on top of the sandwich before baking and then bake as directed above. No, not the hot pocket variety. This is so much better and it’s nice enough that you can take it to a picnic. One pocket serves four, especially with a nicely dressed salad. Lay the pie crust flat on a piece of baking paper. Spead all over with a generous quantity of mustard and then arrange the sliced onion down the middle third. On top of the onion, arrange the cheese and then the ham. If you do want to add tomato, remove the pulp and seeds first, otherwise it will be runny. Fold the crust over on itself to make a large rectangle, making sure that the pocket is completely sealed. Bake at 350° for about 20 minutes or until golden. Delicious hot, warm or cold! Talk about the ultimate comfort food. Layers of bread, ham and cheese are soaked in egg mixture and baked, for a gooey goodness that melts in your mouth. Butter the bottom of the casserole. 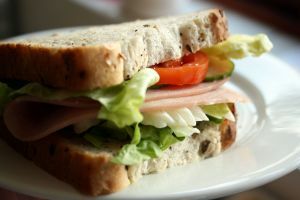 Arrange six slices of bread, then place three slices of ham on the bread. Sprinkle with the cheese (the more the better). Season with salt, pepper and dill to taste. Repeat two more layers. Mix the milk and eggs and then pour over the bread and ham layers. You want the liquid to come at least three fourths of the way up the casserole dish. Press down on the bread so that it absorbs as much liquid as possible. Let sit for half an hour before placing in the oven, at 350° for at least 30 minutes, or until cooked through. I’ll add one from around here, ham and cheese quesadilla. Butter a flour tortilla and place butter side down in a hot frying pan. Cover with thinly sliced ham and shredded cheese of your choice then place a second buttered tortilla on top-butter up. When the bottom is brown and crispy and cheese is melty, flip and fry the other side. Cut into wedges and serve. My kids love them! Katies last blog post..Welcome to the New Digs!